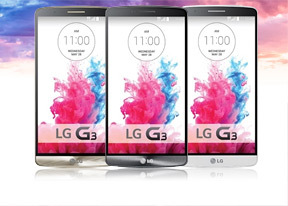 The LG G3 is powered by a Snapdragon 801 chipset and runs the latest Android 4.4.2 KitKat. Note that the G3 comes in two versions - one with 2GB RAM and 16GB storage and one with 3GB RAM and 32GB storage. Both have microSD card slots, but having an extra gig of RAM might just push some people to buy the pricier 32GB version. LG applied its own software customizations and we're pleased to announce the end result is a much more attractive flat design. LG was particularly proud of how mature the colors and icons of the interface feel (previous LG skins have traditionally been bright, colorful and skeumorphic). See a video of the LG G3 user interface and camera features in action below. 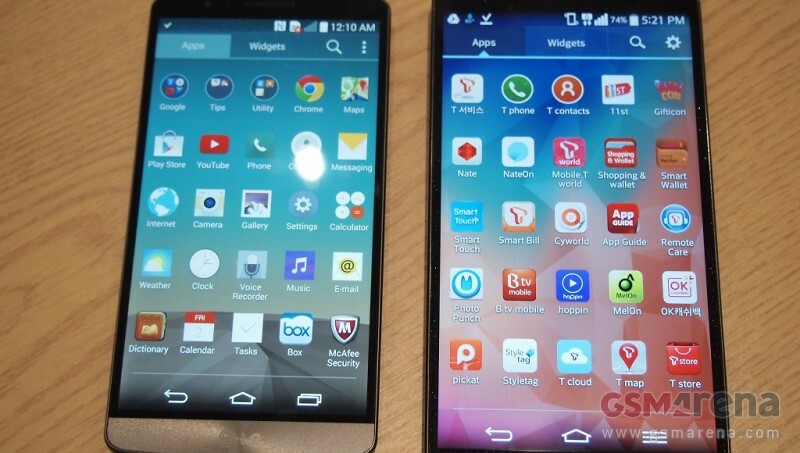 The LG G3 also features Knock On (tap to wake), which is quickly growing in popularity among users. Knock Code allows you to make this unlock method secure by designing your own sequence of three to eight taps (there are 80,000 variations). That and a few other features are part of what LG calls Smart Security. Content Lock hides sensitive files and photos, so you don't have to worry about lending your G3 to a friend. This feature works for files in the internal memory and on the microSD card, it will even block access to the files if you hook up the LG G3 to a computer using 128-bit encryption. Kill Switch is the third security feature. It allows you to remotely disable the phone and in case you can't recover it, delete all the data on it. What makes Kill Switch different from Android Device Manager is that it also performs antivirus scans (the Google Play Store already has a similar feature). The new Optimus UI software features two new additions, Smart Notice and Smart Bulletin. Smart Notice is similar to Google Now, it uses clever algorithms to provide timely, relevant information based on the status of the phone, your behavior and location. For example, it will check your call history and remind you of missed calls or offer to turn the Wi-Fi back on when you arrive at the office. It will even manage your storage by offering to delete apps and files you haven't used in months and advise you to take an umbrella if it's going to rain later that day. Smart Bulletin is LG's rendition of a news reader. The keyboard was also imbued with new features. Obviously a QWERTY keyboard covering half the 5.5" screen would be too much so the new keyboard simply lets adjust its size. Unfortunately, you cannot do that just by dragging it, you have to go to the Settings to pick one of the several available levels. Here goes a more detailed look at Smart Notice as well as LG's QWERTY keyboard. In a BlackBerry-esque twist, the keyboard will suggest two words as you type and you can select one of them by swiping up with either your left or right finger. To go back and edit text, you hold down the Space key and then swipe left or right to move the cursor. However clever that is, the keyboard will also try to minimize typos by learning your typing habits.